In The Story of an Hour by Kate Chopin we observe many instances of irony. Irony is the use of words to express something different from and often opposite to their literal meaning. In this story there are three different types of irony used, they are: situational, dramatic and verbal. Situational irony is used to show the reader that what is expected to happen sometimes doesn’t. Dramatic irony is used to fill the reader in on something that the characters in the story do not know about. Verbal irony is a figure of speech in which what is said is the opposite of what is meant. Situational irony is used in “The Story of an Hour” through Mrs. Mallard’s reaction to her husband’s death. When she first heard the news of her husband’s death, Mrs. Mallard, “wept at once, with sudden, wild abandonment” (188). It appeared to everyone in the house that she was very sad and went upstairs to be alone in her room. This is a typical reaction after having just lost a loved one. However, once Mrs. Mallard is alone in her room, we as the reader witness that she is not saddened by the loss of her husband but rather relieved. She saw beyond that bitter moment a long procession of years to come that would belong to her absolutely. And she opened and spread her arms out to them in welcome” (189). It turns out that Mrs. Mallard is actually happy that her husband has died and instead looks forward to her coming years being free. Dramatic irony is also used in Chopin’s “The Story of an Hour” through Mrs. Mallard’s realization that she is free from her husband and with her death. While Mrs. Mallard was alone in her room she realized that she would no longer be bound to her husband but rather free to do whatever she should choose. However, no one else in the story knew this; they all believed that she was very sad and depressed. Josephine, a woman in the house, even thought Mrs. Mallard was making herself sick. She said: “I beg; open the door – you will make yourself ill” (189). She did not know that Mrs. Mallard was actually fine. Another example of dramatic irony is when Mrs. Mallard dies. When she finds out that her husband is still alive she dies from an immediate heart attack. The narrator of the story says; “When the doctors came they said she had died of heart disease – of joy that kills” (190). Even though all of the characters in the story believe she died because she was so overwhelmingly happy her husband was alive, we, the readers know that she died because she was very upset and shocked. The final irony used is verbal irony. Verbal irony is found in the title, “The Story of an Hour”. These words suggest a short period of time in which usually not a lot of events occur. However, in this story an hour seems like a lifetime. The main character, Mrs. Mallard, experiences grief, depression, sadness, happiness, and hope all within the time span of an hour. Through the title, we are able to witness that quite a lot of things can occur in a short period of time. In conclusion, “The Story of an Hour” by Kate Chopin proves to be filled with all three different types of irony. 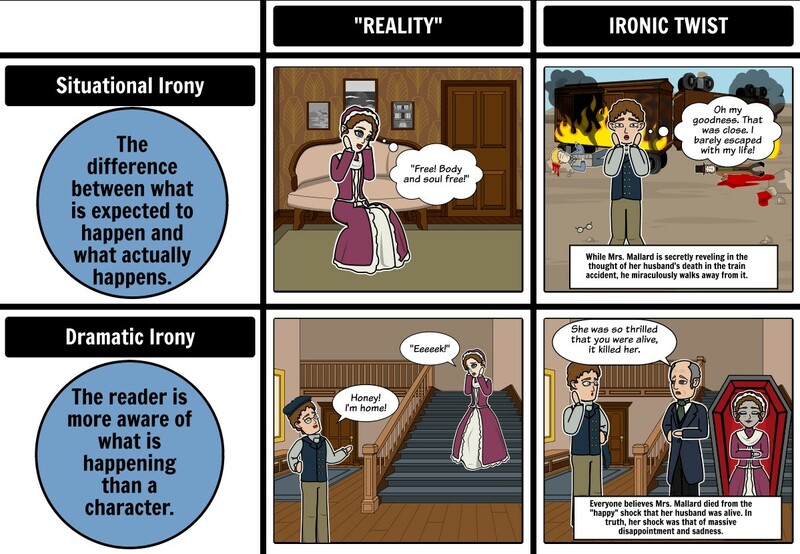 Situational, dramatic, and verbal irony examples are found throughout the story. We can find that Kate Chopin’s writing often parallels her life. She experienced a lot of suffering and was actually encouraged to write fiction by her doctor. Much of her writing is based on her own sufferings and is often filled with irony that is very subtle.